At Ardgowan Distillery we are genuinely committed to craft, supporting some of the very best artisans in the country as we progress ambitious plans for our new distillery. The Ardgowan Distillery will not be a place just for finely-crafted single malt, but a home for skilled artists and makers; where they can work and showcase their wares to a discerning audience. Already we are working with craftspeople like Alan Wilkie, one of Scotland’s last creators of fully handmade sgian dhubs, and the Inverclyde Community Development Trust, which is producing hand-turned quaichs made of sustainably-sourced Scottish ash, cherry or oak. Visit our shop below and become part of our story. In a world of mass-produced items, every one of this very limited run of 17 sgian dhubs is unique. 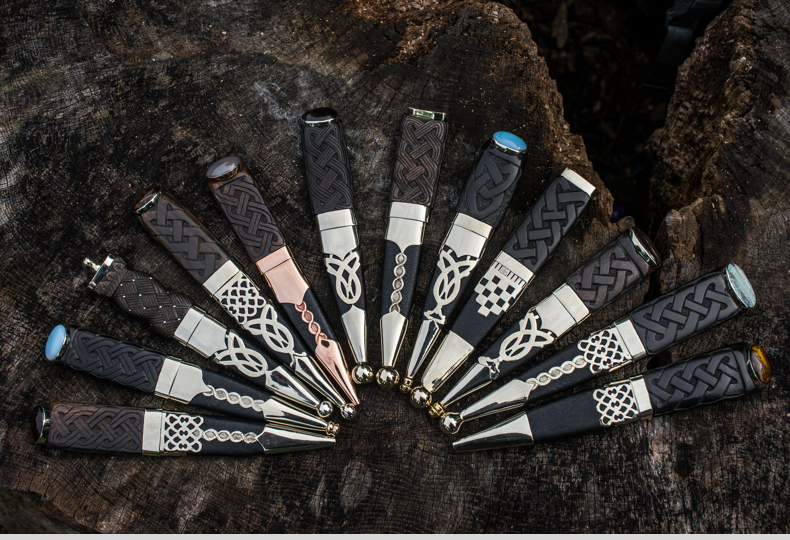 Hand made from start to finish by master silversmith Alan Wilkie, each sgian dubh (meaning black or hidden knife) is crafted from reclaimed hardwood, colourful gemstones, Moroccan goatskin and decorations made from bronze or Victorian silver plate. The perfect finishing touch to Highland dress, and a wonderful heirloom to pass on. 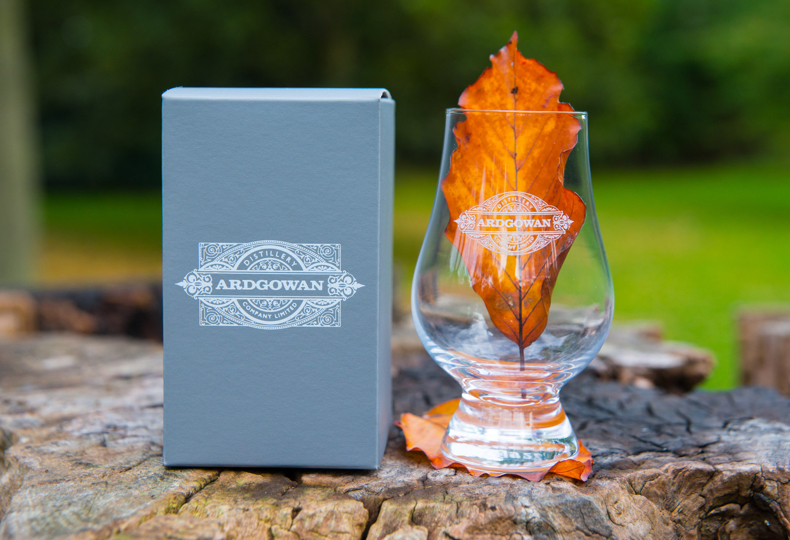 The ideal gift, these Ardgowan Distillery nosing glasses are the perfect way to savour your favourite dram. This glass has been specially designed to enhance your whisky drinking experience. Its tulip shape gently holds the whisky’s aromas, while the solid base provides a comfortable, sturdy grip. Available singly, in a stylish Ardgowan-branded presentation box. 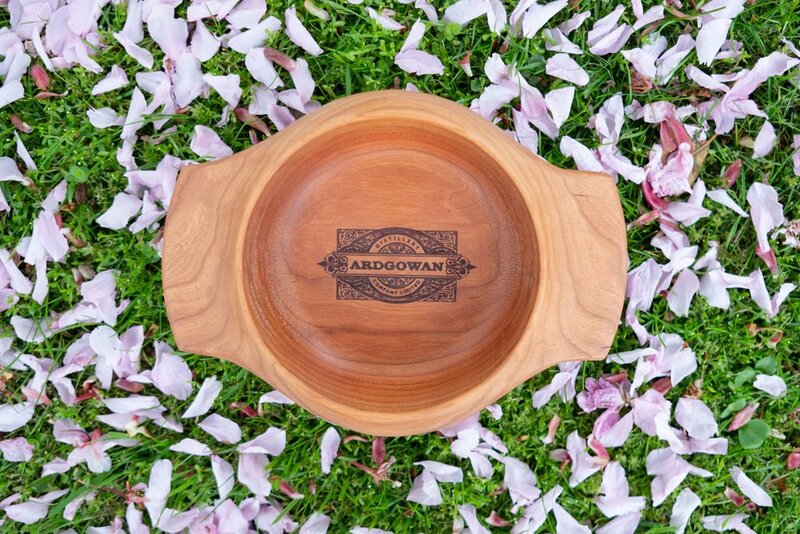 These quaichs, or traditional drinking cups, are made of sustainably-sourced Scottish beech, cherry or oak and are hand-turned and finished with a laser-etched Ardgowan Distillery logo. This skilled, labour-intensive work is carried out by local workers at Newark Products, a social enterprise in Port Glasgow which is part of the Inverclyde Community Development Trust – an organisation which aims to give people a route back to full-time employment. Prices from £19.99 to £29.99. These cheese boards are made from locally-sourced oak and are handmade and finished with a laser-etched Ardgowan Distillery logo by the same team at Newark Products that made our wooden quaichs.